You know what’s not a great gig? Being a small-town sheriff in the movies. We’re sure we could come up with plenty of exceptions if we put our minds to it, but it seems like nine out of ten movie sheriffs fall into one of three categories: corrupt weirdoes, comic-relief dummies, and, well, guys who get killed by the monster or villain or virus outbreak or whatever happens to be the main antagonist of the movie in question. And no matter which category they fall under, if you see the sheriff enter a room with no witnesses, you can bet that something memorable is about to happen, whether it’s intimidating a suspect, taking a wacky pratfall, or getting eaten by some kind of mutant forest animal.. So even if those movie sheriffs don’t generally end up in the greatest of situations, the actors playing them always seem to be having a mighty fine time. It’s usually a lot of fun watching them hurtle toward their bad ends, and most of the time it helps the hero along the way to a happy ending. Whatever their quirks and failings, we’re glad that small-town sheriffs have carved out their strange little niches in movie history. 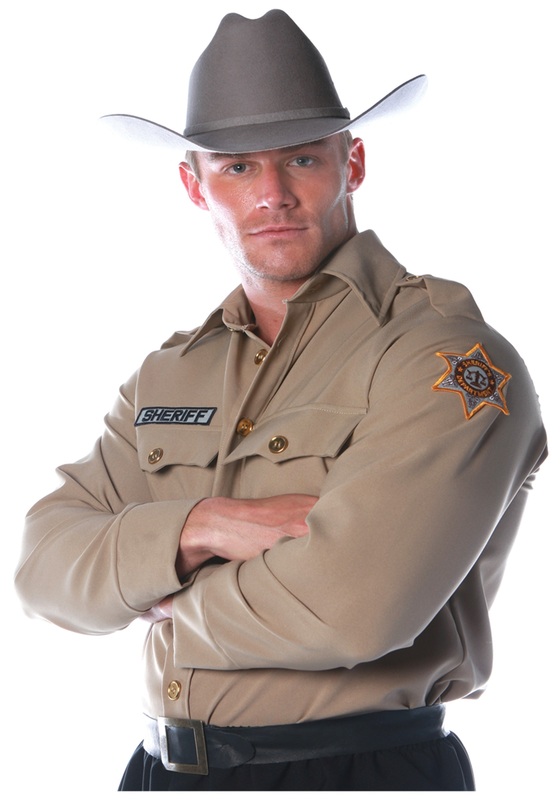 See if you can survive until the closing credits in this classic sheriff’s shirt. It’s an instantly recognizable look in tan polyester, with a button-up front, a nameplate over the faux chest pocket, and star patch at the shoulder. Whether you’re playing it as a sketchy tough guy, a backwoods goofball, a doomed public servant, or just, you know, a dedicated small-town sheriff, this is the look that’ll keep the criminals at bay.